Whether they’re new to the family, or perhaps just going through a tough time, the Snuggle Puppy is designed to provide comfort and helps relieve anxiety in your four-legged friend. Whatever the case, whether crate training, fireworks, or perhaps a thunderstorm, rest assured this dog anxiety solution will be there to help. Dogs are pack animals and are instinctively drawn to their mother and others in their pack. 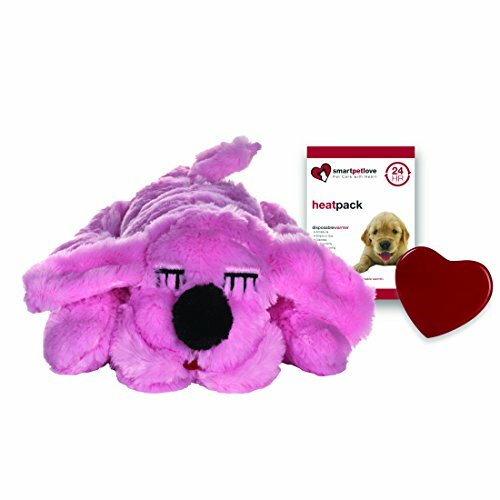 The Snuggle Puppy recreates that intimacy with physical warmth and a “real-feel” heartbeat. The result is a calmer, more peaceful pet – one that feels less loneliness, fear, and separation anxiety. Snuggle puppy uses a "real-feel" pulsing heartbeat, the 2 AAA batteries (included) last up to 2 weeks with continuous 24/7 use and the hearts on/off button allows for use when you need it by pressing for 8 hours of use or holding it for 5 seconds to turn continuous mode on/off. Included with your Snuggle Puppy is one disposable warmer pack (non-toxic, safe for people and pets, each pack lasts 24 hours) for an extra source of comfort for your pet. Snuggle Puppy is all natural, without medication, not a restraint, and calms your pet by appealing to basic natural instincts. The snuggle puppy is machine washable as well, on a gentle cycle without the heartbeat inside. If you have any questions about this product by Smart Pet Love, contact us by completing and submitting the form below. If you are looking for a specif part number, please include it with your message.